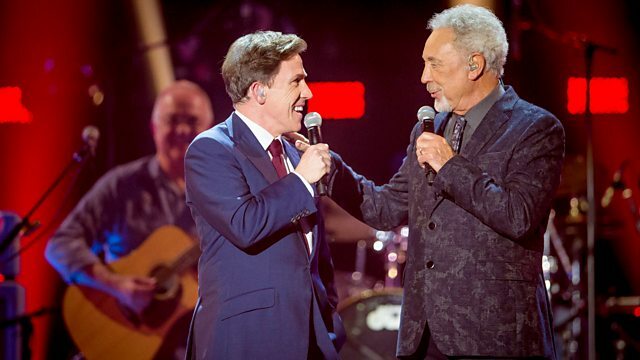 Sir Tom Jones and Rob Brydon join forces for a spectacular night of music and comedy in aid of BBC Children in Need. Sir Tom Jones and Rob Brydon join forces for a spectacular night of music and comedy in aid of BBC Children in Need. With special guest appearances by David Walliams, Jessica Hynes and Steve Coogan, who stars alongside Rob Brydon in a one-off Tom Jones-themed mini-episode of The Trip. This unique concert, recorded at Wembley Arena, celebrates Sir Tom's remarkable career with performances of some of his greatest hits and collaborations with artists including James Morrison, Laura Mvula, Dame Evelyn Glennie, the Shires and Chickenshed, as well as comedy sketches and iconic archive footage depicting many of the highlights of Sir Tom's remarkable life so far.